WE ARE MOVING MAY 2019! More info on our new location here. Our typical Academy hours are Monday-Friday 4 pm - 9:30 pm, Tues-Friday 11 am - 1 pm, Saturday 10 am - 2 pm. For the quickest response, if you are interested in contacting us outside of these hours, please email us at info@bmoregjj.com. If you are a member and need to contact us in regards to your membership, please email Alexis@BmoreGJJ.com. We have parking! We do have a small parking lot on premises which fits approximately 9 cars. We have additional parking on the side of the building in our gated lot. 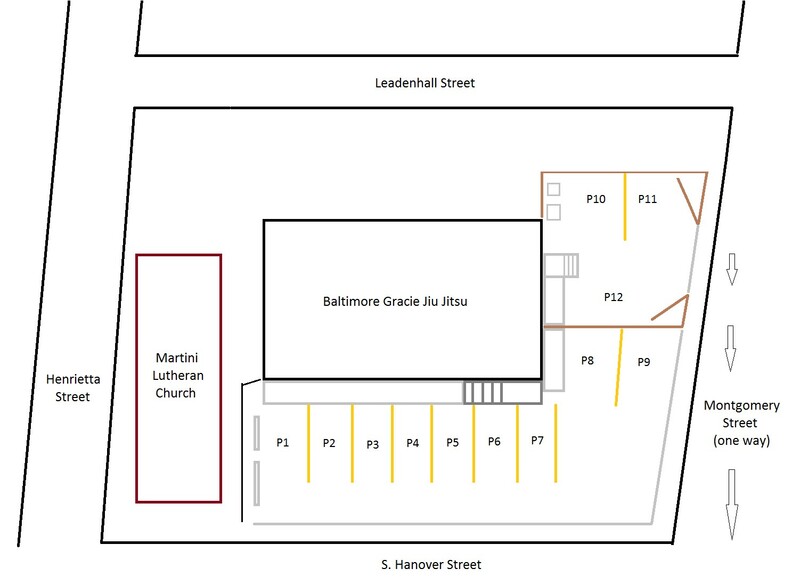 To reach the lot you must circle behind the building by turning at the church on Henrietta, a right onto Leadenhall, and another right on W. Montgomery St. There is street parking, a parking garage a few blocks away located on West St., as well as metered parking on Leadenhall St. We suggest if you live in the city to use public transportation, walk, ride, or carpool, to help save spots for our students who live in the counties. Our neighbors, Martini Lutheran Church, have graciously allowed us to use their parking lot during non-stadium events. (Please be aware, during baseball/football games and other stadium events the church charges a fee to park.) They are located next to the academy at the corner of Hanover St. and W. Henrietta St.